On October 8, 1891, Ben Hur Shrine met under dispensation in the Oasis of Austin, Texas. Imperial Potentate Sam Briggs had appointed Illustrious Sir George H. Green, Potentate of Hella Temple in Dallas, Texas, to conduct the first meeting of the Ben Hur Shrine. Ben Hur Shrine continued to meet under dispensation, until the 1892 Imperial Council session held in Omaha, Nebraska. On August 15, 1892 the Imperial Council granted Ben Hur Shrine its Charter. When Ben Hur Shrine received its Charter it was the second Shrine Temple in Texas and the 58th Shrine Temple chartered. The first Ben Hur meetings were held in the Masonic Lodge located behind the main Austin Post Office and in 1910 Ben Hur and the Austin Scottish Rite Valley purchased an Opera Theater. This building is still the current Scottish Rite Building in Austin. In 1914 Ben Hur sold its interest in the building to the Scottish Rite and while Stated Meetings were still held at the Scottish Rite building, the various Units met at other locations around Austin. In the 1960’s Ben Hur purchased a warehouse in north Austin, on U.S. Highway 183 near its intersection with Lamar Boulevard, for Unit meetings and other events. In 1974 Ben Hur sold this property and acquired 18 acres on the west side of Austin in the community of Westlake Hills. In 1975 construction was begun on an activity building and by 1976 offices were added and Ben Hur moved its Stated Meeting to the new facility, as well as its Unit meetings. The new Ben Hur was located adjacent to Westlake High School. The Ben Hur property was a great location with great view corridors of Austin and a good location for the Nobility. During its time there Ben Hur received several offers to purchase the property. One offer was for $7,000,000 cash and allowed us one year to relocate. However, the Nobility had no desire to relocate so every offer was rejected. Unfortunately the Westlake School District wanted the property and in 2001 they took it by eminent domain proceedings. After a headed legal battle Ben Hur was paid $3,400,000, which we were told was sufficient to purchase a like parcel of land and build a comparable structure. The check for the property was delivered to Ben Hur by a School Board Member, accompanied by a Deputy Sherriff, with an order to vacate the property within 48 hours. Ben Hur complied with the court order. This unfortunate chapter in the history of Ben Hur was devastating to our membership and caused the loss of many historical items and records. The school district put forth several bond issues to the voters of the District for the development of the Ben Hur property, but the community rejected the bonds and the property was not developed. The school district didn’t use the property in any productive way, except parking, for many years. In about 2013, the old Ben Hur buildings were torn down. The school district still continues trying to use the property, without going back to the voters of the district, by leasing the property to others. For a three year period, Ben Hur was without a home and meeting at various locations including the Scottish Rite Temple, the Elks Lodge and a rented location on Airport Boulevard and finally an office building belonging to Noble E. M. Lawrence, who allowed us to meet there at no cost. Noble Lawrence was awarded a life membership to Ben Hur for generosity. Ben Hur purchased approximately 29 acres on Highway 71 approximately three miles east of the Austin International Airport with the intention of building a new center. The purchase price was $185,000. Three bids were received for the construction of a new facility comparable to the one in Westlake Hills. The lowest bid, including the cost of the land, was $1,000,000 more than the amount the school district had paid for the Westlake property. As the cost of building escalated and the time to do construction increased, the Nobility voted to purchase an existing building. Ben Hur Shrine acquired a closed funeral home, located at 7811 Rockwood Lane in Austin, and remodeled it for use as the Ben Hur Center and is currently still at this location. While there is no history of why Ben Hur was named “Ben Hur”, it was the name of the second bestselling book behind the Bible from 1880 to 1936. The book “Ben Hur”, the actual name of the book was “Ben Hur: A Tale of Christ” was written in the 1870’s by Union Civil War General Lew Wallace. In addition to being a Civil War General, General Wallace served as territorial Governor of New Mexico during the time of Billy the Kid. Of course, Ben Hur Shrine was chartered and named prior to any of the “Ben Hur” movies, so our name came from the book, not the movies. Ben Hur published brochures during its early years, especially about upcoming Ceremonials. And, in the 1930’s Ben Hur started publication of a newsletter and named it “The Chariot”. The Chariot was published periodically until after World War II and starting in 1947, The Chariot was published monthly as Ben Hur’s method of communication. While electronic communications are changing how The Chariot is received by the Nobility, The Chariot continues to be the official communication method. Ben Hur Shrine’s first circus was in 1942 and in 1948 Ben Hur Shrine Circus became an annual event in Austin and has entertained thousands of Central Texans over the years. The Ben Hur Circus continues to be a principle fund raiser and fun event for Ben Hur. Every Shrine Center has its own unique fraternal pin. 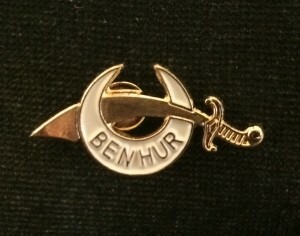 When Ben Hur was chartered in 1892, new pins were ordered. When the pins arrived, it was discovered that they had been made with the Simitar upside down, which is a sign of distress. The manufacturer refused to replace the pins saying that he had made the pins exactly as requested. Since Ben Hur had just been established and had no funds to replace the pins, the Potentate contacted Imperial Headquarters, explained the problem and requested permission to use the upside down pins. Imperial granted special dispensation to Ben Hur to use the pin as manufactured and to this day, it remains our Ben Hur’s official pin. The Purpose of Ben Hur Shrine is Fun, Fellowship and Brotherly Love and that is our foremost objective. Ben Hur representatives were present at the Imperial Shrine Convention when delegation voted to have a philanthropy and open a children’s hospital for the purpose of treating children with polio. That first hospital was opened in 1922 in Shreveport, Louisiana and over the years has increased to 22 hospitals for children. Shriners support Shriners Hospitals for Children, a health care system of 22 hospitals that are committed to providing the care for children in our specialty areas of Orthopedics, Burn Care, Spinal Cord injury and Cleft Lip and Palate, regardless of a family’s ability to pay. 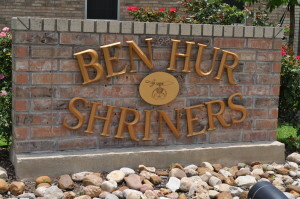 Throughout Ben Hur Shrine history, Ben Hur has been a consistent contributor to the world greatest philanthropy Shriners Hospital for Children. Ben Hur Shriner’s truly know and support the mission of our hospitals and believe in the meaning of the slogan “No Man Stands So Tall As When He Stoops To Help A Child”.